Our History: RTS Global Partners was incubated from the 30th September 2012 and officially launched on 1st January 2013, based on the high demand and needs of our international clients. RTS was incubated by RAW Group, established in 2002 in London-United Kingdom by the Founder, and then expanded to Dubai-United Arab Emirates in 2004. RAW Group/RTS has built its reputation upon working with over 500,000 CEO’s/MD’s (and delivering speeches to date to 3 million people) in 64 countries, by sharing it successful “Unleash Your DNA” leadership and transformation programs and implementing its “DNA Profiling Model” and toolkits. This resulted in clients asking for hands-on advisory assistance at Board Level. In 2012, RAW Group started the process of developing a new brand identity and business model, and RTS Global Partners was born. In 2017, RTS re-positioned it’s brand, hired a new executive team and advisory board, and updated its long-term strategy to build a ‘Global Family Business Platform’ with our philosophy of ‘One Family . One Legacy’, linked to our core values to Respect, Trust and Serve (RTS) all our Clients and Partners. RTS focuses specifically on providing customized solutions to drive Regeneration, Transformation and Succession (RTS) paths and results for our clients. 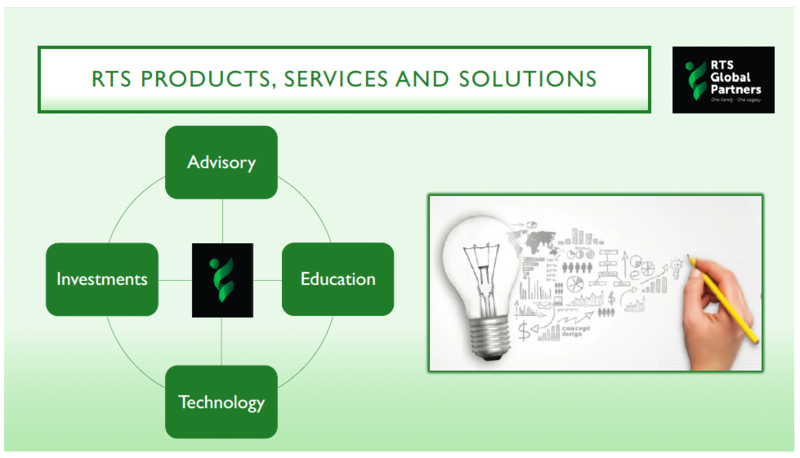 We offer leading-edge scientific and practical advisory, consulting, education, technology and investment solutions to family owned businesses and conglomerates. As a rapidly-growing firm, we have 14 full-time members and joint venture partners; and 30+ external consultants and alliance partners, that have supported hundreds of key clients in 22 countries to date, and adding value to millions of employees with our collective knowledge capital and systems. Our company is the creator of the ‘Unleash Your DNA’ brand and ‘The DNA Model’, including the ‘Family MBA’ program and the ‘RTS Family Business Governance Framework’. Eighty percent of our senior leadership team are client-facing professionals from different nationalities. We have a clear vision to expand our Partner Platform to 100 countries by 2033 across Africa, Middle East and Asia and service thousands of clients. the Next-Generation, we have a rich portfolio of services and solutions, that can be customized for your Family DNA. We don’t copy and paste as we know every family is unique. It also encapsulates our foundation of Regeneration, Transformation and Succession. Most companies have a Vision & Mission Statement mounted on the wall in their boardroom (which most people have forgotten about), however at RTS we have been implementing our V.I.P. Toolkit successfully for clients and have proven ways to make it come alive throughout the company with different communication mechanisms. V.I.P. stands for Vision, Intention & Purpose. The Vision is about WHERE? we want be in the future; the INTENTION is about WHAT? must happen to get there and the PURPOSE? is all about WHY we are doing this. To successfully build the World’s Largest Family Business Eco-System Platform with 1,000 RTS Partners (Principal Owners and Advisors), who will professionally establish RTS in 100 countries by 2033, and then together as one global team, continue to serve thousands of clients from generation to generation with an innovative portfolio of advisory, education, technology and investment solutions. To proactively support family owned businesses and fast-growing entrepreneurial businesses to build a family legacy, retain family unity, develop regeneration paths, transform businesses and build sustainable succession plans, aligned to our clients’ strategic vision, intentions and purpose. To be the trusted global family business brand that has made a significant impact to millions of families, and their respective employees and communities. Beyond business to put family first and express our philosophy of one-family one-legacy. 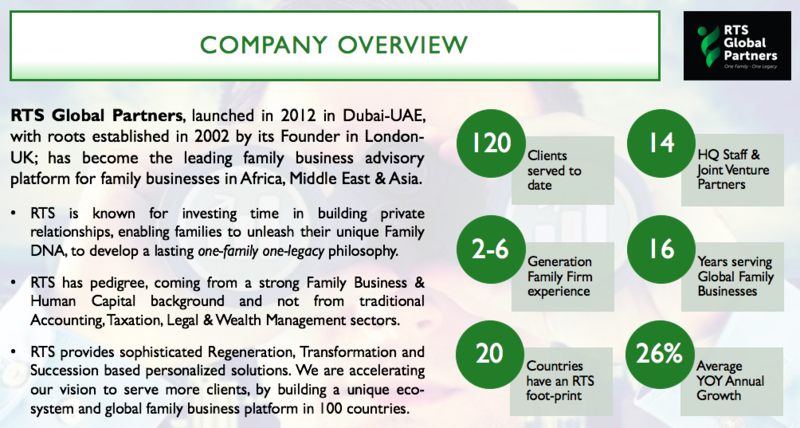 RTS Global Partners is the first company of its type in Africa, Middle East & Asia to provide superior blended solutions in the areas of executive advisory, management consulting, executive search, succession planning, technology transformation and strategic ventures solutions to only family-based business groups and conglomerates. We are not accountants, lawyers or wealth managers – we do everything else they don’t do! RTS Global Partners and its senior team of professionals have supported hundreds of family-based businesses and conglomerates globally, ranging from $5m to $5b turnover companies. RTS Global Partners has supported many family-business groups to make the transition from working IN the business to working ON the business, and focusing more on strategy and developing new ventures to increase their wealth pool. The key is to hire professionals and build the right dream team, and not leave things to random chance. RTS Global Partners also supports’ entrepreneurs who want to build fast-growth enterprises, that require the right dream team of professionals. RTS Global Partners has a variety of Service Level Agreements (SLA’s) to suit your investment needs and budgets.